August 1944. The Allies enter Paris. Before dawn, Dietrich von Choltitz, German military governor of Paris, prepares to execute Adolph Hitler's orders to blow up the French capital. Bridges and monuments are all rigged to explode. For what reasons did von Choltitz refuse to carry out the Fuhrer's commands, despite his boundless loyalty to the Third Reich? Was it Raoul Nordling, Swedish consul-general to Paris, who made the General change his mind? 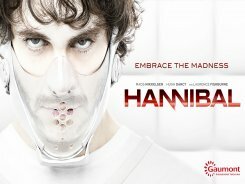 From the imaginative mind of Bryan Fuller (Heroes, Pushing Daisies), and the artful direction of David Slade (Twilight: Eclipse, 30 Days of Night), comes a one-hour drama series exploring the early relationship of Thomas Harris' famous characters-psychiatrist Hannibal Lecter and his patient, gifted FBI criminal profiler Will Graham. This stylized thriller tells an origin story of masterful manipulation. The dark and haunting series 'Hannibal' returns for a second season, with more shocking revelations and games of psychological cat and mouse. Will Graham (Hugh Dancy) is locked in a mental asylum accused of Hannibal Lecter's crimes (Mads Mikkelsen). Now that Will sees Hannibal for what he truly is, he faces a fight to prove his own sanity and convince those closest to him he is innocent of murder. Jack Crawford (Laurence Fishburne) is dealing with his own feelings about Will, and whether his protégé is in fact a cold-blooded killer. Looking for answers, Jack turns to a man he has come to trust: Hannibal Lecter. With Will locked up, Hannibal becomes Jack's new consultant on cases. 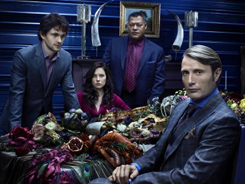 Hannibal is torn between self-preservation and his desire to keep Will close to him, despite advice from his psychiatrist Bedelia Du Maurier (Gillian Anderson) to stay away. The deadly dance between these characters continues to turn in startling and unexpected ways, in a season that will show nothing can ever be the same again. The dark and haunting series "Hannibal" returns for a third season, revealing the fates of characters hanging in the balance, and the continuing psychological cat and mouse games they face. 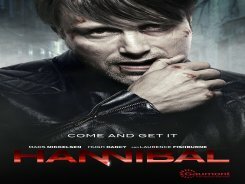 After the shocking events of the season two finale, Hannibal (Mads Mikkelsen) is on the run in Europe-accompanied by his psychiatrist Bedelia Du Maurier (Gillian Anderson)-sporting a new identity, but servicing the same insatiable appetite. As the lives of Will (Hugh Dancy), Jack (Laurence Fishburne), and Alana (Caroline Dhavernas) converge toward Hannibal again, each with their own motivations to catch him once and for all, their deadly dance turns in startling and unexpected ways. 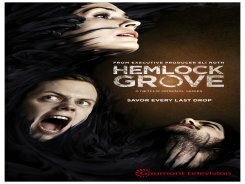 In the second half of the season, Jack implores Will to help him catch a new threat, a serial killer preying on families, known in the press as the Tooth Fairy, but self-proclaimed as The Great Red Dragon. 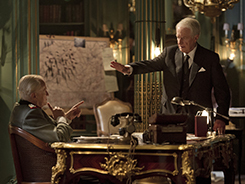 The hunt may force Will to turn to an unwelcome source of insight-his old adversary, Hannibal. 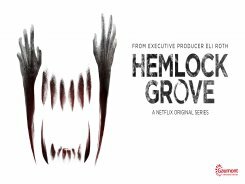 From acclaimed director Eli Roth, and based on the gothic novel by Brian McGreevy, comes a groundbreaking series that tells the tale of the unraveling of a once vibrant and now struggling community, after a mysterious death. 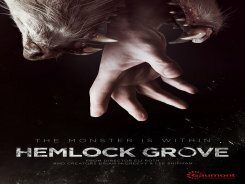 As the town's secrets begin to unravel, Hemlock Grove forces us to ask: what is the true nature of a monster? Today, in a region of mountains and lakes, somewhere between Switzerland and France. Marc, in his forties, is a professor of literature at the University of Lausanne. He has one love affair after another with his students. Still single, he lives with his sister Marianne. They share a huge, isolated chalet they inherited when very young. Winter has almost ended, when one of his most brilliant students, Barbara, disappears. Two days later, he meets Anna, Barbara's mother, who wants to find out more about her vanished daughter.